Veritas have a reputation for innovative tools and this saw is no exception. When it was first introduced its distinctive appearance no doubt caused a few raised eyebrows among the more traditional dovetail saw users, me included. This is in no small way due to the revolutionary spine material, an advance composite of stainless-steel powder for weight, glass fibre for stiffness and a polymer resin binder which is then injection-moulded onto the blade to create a very solid assembly. I'm assured that if the saw ever became accidentally bent, it could be straightened. A single brass screw is also moulded into the back and this is used to secure the bubinga handle. Veritas even include a plan so that owners can make a custom handle for their saw. After a while this saw's appearance grew on me, and when I picked it up and used it at the bench I liked it even more. It's supremely comfortable; the forefinger rests effortlessly along the spine due to the smooth transition between the handle and the back. It proved equally easy to use for parallel cuts down the grain, and the finish left from the cut in some American red oak was superb. This excellent new saw utilises state-of-the-art materials. 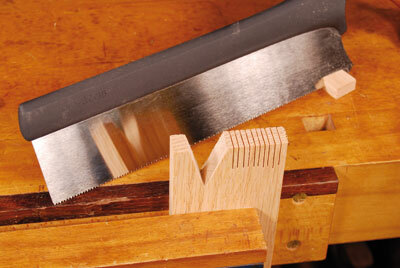 If you're in the market for a dovetail saw, this is worthy of very serious consideration. It has a 0.020in high-carbon steel blade, having 0.003in set each side with 14tpi rip-tooth configuration. Sharpening can even be done by the user as the teeth are not induction hardened. "Veritas even include a plan so that owners can make a custom handle for their saw"